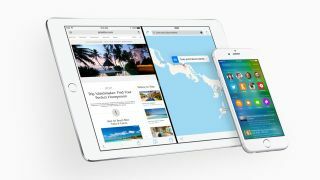 iOS 9 was revealed at Apple’s WWDC 2015 keynote today, but one interesting feature in the upcoming mobile operating system was not mentioned: the company’s new Move to iOS app. Apple’s goal with Move to iOS, detailed on its iOS 9 preview page, is to make the migration from Android to iOS devices a bit less painful. As a survivor of this pilgrimage myself, I can attest that this is no easy process. Since the two tech giants are in direct competition, moving between them can feel a bit like pulling teeth. To make the move from Android to iPhone, you simply download the Move to iOS app on both devices and the app will transfer all your important data. From your contacts, camera photos, messages, bookmarks, calendars, books, DRM-free songs and more. Additionally, any apps you had on your Android are suggested in the App Store. And finally, all of your paid apps are saved to your iTunes Wish List. Apple may have delivered a strong blow to Android by making it easier to switch from your Android to an iOS device, but oddly chose not to publicize it. This feature will come bundled with iOS 9, set for a free release in the Fall, and open to public beta testing in July.